Background: Adnexal masses result from benign or malignant lesions of ovarian, tubal and paratubal origin as well as pregnancy related causes such as mullerian anomalies, infectious causes and ectopic pregnancy. The current study aimed to evaluate the preoperative diagnosis, surgical procedure and histopathological findings of adolescent girls who underwent laparoscopic surgery for adnexal mass in our hospital. Materials and Methods: A retrospective chart review of patients with adnexal mass was conducted over a period of one year from Jan 2014-2015. Overall 96 patients were included in the study after reviewing clinical records. In all the patients' malignancy was excluded by preoperative imaging with sonography, CT or MRI and tumor marker study. Results: Laparoscopy was the operative approach for all 96 patients. None resulted in malignant histology. Majority of the adnexal masses were simple cyst (28%), 11.4% were dermoid cyst, 2% were endometriotic cyst. One patient had tubal ectopic, 3 patients had Koch's abdomen and pelvis. Among them one 13 year old girl underwent rudimentary horn excision who presented as a para tubal mass with acute abdomen. Almost half of the patients (68.7%) presented with acute abdomen of which 41.6% were adnexal torsion. All adnexal masses were resected laparoscopically and the outcome was uneventful in all the patients. Conclusion: Laparoscopy is regarded as an appropriate surgical method for benign adnexal masses which was safe and effective even for giant ovarian cyst in well selected cases as most of the pelvic adnexal masses seen in adolescents and young girls are of benign nature. Adolescence starts with the beginning of physiologically normal puberty. This period roughly corresponds between the ages of 10 and 19 years as defined by the World Health Organisation. The incidence of adnexal masses in the pediatric and adolescent population is approximately 2.6/100,000 lakh girls per year. Most of the adnexal masses during this period are functional ovarian cysts and benign neoplasms. Nowadays, laparoscopic management of adnexal mass is one of the most frequently performed laparoscopic interventions. Careful and meticulous preoperative evaluation is important for the appropriate and successful use of laparoscopy. The exclusion of malignancy is the principal aim in the evaluation of an adnexal mass. The advantages of laparoscopic approach should in no way compromise the clinical outcome of a malignant adnexal mass. The laparoscopic puncture of a malignant ovarian mass though uncommon should be avoided whenever possible. However, histopathology alone can definitively diagnose the nature of an adnexal mass as benign or malignant. This is a retrospective analytical study in the Department of Endogynecology, GEM Hospital and Research Centre after approval by ethics committee. The medical records of 96 patients who were admitted to the gynecology department with a diagnosis of adnexal, tubouterine or ovarian benign neoplasm from January 2008 to January 2012 were analyzed. Patients below the age of twenty were included in the study. Those patients with an adnexal mass who were either managed medically or diagnosed with malignancy were excluded from the study. Data for all the patients were recorded in terms of age at the time of surgery, presenting complaint, menstrual complaints, cyst size on ultrasound, tumor markers (cancer antigen [CA] 125, CA 19-9, alpha-fetoprotein [AFP], β-human chorionic gonadotrophin, carcinoembryonic antigen), surgical procedure, preoperative findings, and definitive histopathology. For preoperative evaluation of adnexal mass, Ultrasound or computed tomography (CT), magnetic resonance imaging (MRI) was used. Data were entered into a Microsoft Excel database (Microsoft Corp., Redmond, WA, USA) and were coded and analyzed. The limitation of the study was that it was a retrospective study with a minimal number of patients due to the fact that benign adnexal masses requiring surgical intervention are less common in adolescents. In our study, from 2008 to 2014, a total of 96 cases with an adnexal mass who were young girls underwent laparoscopic surgery. The mean age of patients in our study was 16 years (range 6–20 years) with a mode of 19 years. Most of the patients (61.5%) were aged between 16 and 19 years. Only one patient (age 6 years) presented with an adnexal mass below the age of 10 years and 37.5% were aged between 10 and 15 years. Among the 96 girls, 84 (87.5%) had attained menarche whereas 12 (12.5%) of them were premenarcheal [Figure 1]. 67.8% (65) of patients presented in an emergency whereas the remaining 32.2% (31) had chronic symptoms. The most common presentation in our study was acute pain abdomen with vomiting [Table 1] 65 patients (67.7%) presented with pain and vomiting. Two patients were asymptomatic wherein the diagnosis of an adnexal mass was incidental. Other presentations noted in our study were chronic pain abdomen, abdominal distension, dysmenorrhea, and menstrual complaints. The mean diameter of the adnexal mass in our study was 9.1 cm (range 3–37 cm). About 67.8% (65) cysts were less than the size of 10 cm. Among them, 6 patients (6 of 65) had increased values of tumor markers. 20.8% (20) were between the size of 10–15 cm [Table 2] 7.3% (7) of the cysts were larger than 15 cm. Tumor markers were measured in all patients (n = 96). Of all the patients, 12 patients (12.5%) had an abnormal result and in the remaining 84 patients (87.5%), tumor marker levels were normal. All our patients underwent ultrasound study of abdomen and pelvis, in those few patients where further imaging was required, CT or MRI was done. Ultrasound examination was correlated with peroperative findings and histopathology of the adnexal mass. In 82 patients (85.4%), the diagnosis on ultrasound was in accordance with peroperative and histopathological diagnosis. 14 patients (14.6%) had a different diagnosis preoperatively and histopathologically when compared with the preoperative ultrasound diagnosis. In 2 patients, who were preoperatively diagnosed with serous cystadenoma on ultrasound, the ovaries were noted to be polycystic peroperatively and ovarian drilling was done. The accuracy of diagnosing an adnexal mass by ultrasound alone in our study was 93%. The management of all the 96 patients in our study was by laparoscopic surgery. The procedures performed were ovarian cystectomy, paratubal or paraovarian cystectomy, salpingectomy, salpingo-oophorectomy, detorsion and ovariopexy, excision of a rudimentary horn. In 70.83% (68) patients, the ovaries were preserved. The histopathological findings of all the 96 patients in our study were either a nonneoplastic mass or a benign neoplasm. 68.8% were nonneoplastic, and 28.12% were benign neoplastic. In 3.2%, the histopathology was not necessary and hence not done. Adnexal mass that had undergone torsion was seen in 40 patients (41.7%). All the cases presented as an acute emergency. 23 patients (57.5%) who presented with adnexal torsion were aged between 16 and 19 years, 16 patients (40%) were in the age group of 10 to 15 years. One patient (2.5%) was below the age of 10 years. 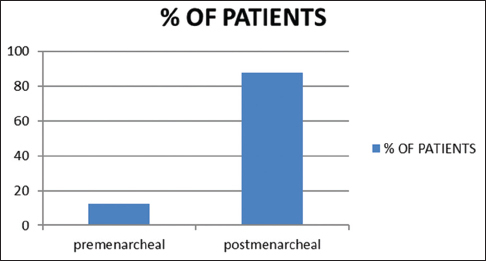 Among all the patients who presented with adnexal torsion, 82.5% (33) had attained menarche and 7% (17.5%) were premenarcheal. The mean diameter of adnexal mass undergoing torsion in our study was 8 cm. Tumor markers were normal (92.5%) in majority except for three patients in whom the tumor markers were raised in spite of a benign histology. The procedures performed were cystectomy, detorsion with or without oophoropexy, salpingectomy, and oophorectomy. Most of the adnexal mass that had presented with torsion were simple cysts (35%) and hemorrhagic cysts (25%) on histopathology. 15% (6 of 40) were paratubal cysts that had undergone torsion. 10% (4 of 40) of them were dermoid cysts. 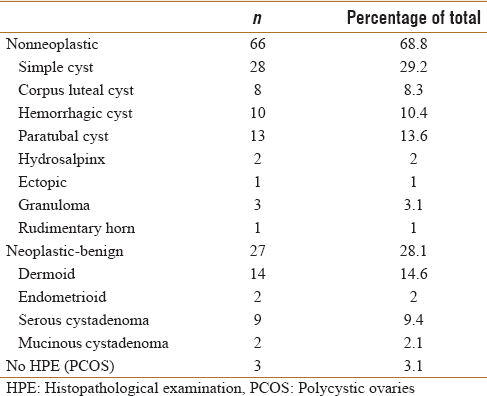 The remaining were polycystic ovary (5%), corpus luteal cyst (2.5%), endometriotic cyst (2.5%), serous cystadenoma (2.5%), and hydrosalpinx (2.5%) [Table 1], [Table 2], [Table 3], [Table 4]. Adnexal masses in adolescent girls are an enigma, and they pose a notable challenge in management. The priority while formulating a plan for management has shifted toward organ preservation in the recent years, unlike the conventional aggressive approach. Adnexal masses in adolescents are more likely to be benign. However, evaluation of any adnexal mass in an adolescent is mandatory and should be meticulous to exclude malignancy. All the patients in our study have been managed with laparoscopic surgery for a benign pathology. The mean age of our study population was 16 years, and the greater numbers of them were aged between 16 and 19. This was in accordance with the study done by Kim et al. where the mean age was 17.1 years. Functional cysts predominate in postmenarcheal girls secondary to changes in hormonal milieu at puberty. Concurrent with other studies,, 87.5% of the girls included in our study were postmenarcheal. Tumor markers were measured preoperatively in all the patients to exclude possible malignancy. As CA 125 has limited specificity in adolescence, CA 19-9, AFP, carcinoembryonic antigen, lactate dehydrogenase were assessed additionally. An elevated level of CA 125 was with a value above 65 U/ml as all our patients were young and accounted for the premenopausal age group.,,,,, Due to the high probability of a false positive or misleading result, an isolated elevated CA 125 level was not considered to be definitely predictive of malignancy. There were two patients with CA 125 value above 100 U/ml of whom one was diagnosed with Koch's abdomen and the other with a hemorrhagic cyst on histopathology. Serum CA 125 can be elevated in various conditions including endometriosis, pelvic inflammatory disease, tuberculous peritonitis, liver cirrhosis, chronic renal failure, pleural effusion and pancreas or colorectal cancer, as well as in postoperative status.,,,,,, Therefore, a differential diagnosis of Koch's abdomen or a chronic inflammatory etiology is to be borne in mind for an elevated CA 125 especially in an endemic region. All the patients were preoperatively assessed by ultrasound. Those cases where the ultrasound examination was inconclusive or suspicious of malignancy further required either a CT or MRI. Ultrasound is well known to be the gold standard in evaluating an adnexal mass.,, The mean diameter of adnexal mass was 9.1 cm. Similar observations were reported in other studies as well (6.27). The sensitivity of ultrasound in diagnosing a benign adnexal mass in this study was 89.1% with a positive predictive value of 95.3%. Marret showed the sensitivity of ultrasound to be 80% which is comparable to ours. In a study by van Calster et al., 98% of benign adnexal masses in premenopausal women were correctly classified by pattern recognition. The same in our study was 85.4%. The higher recognition in their study could be due to the use of transvaginal scan for all patients whereas we have universally done transabdominal evaluation as our entire study group was adolescents. The conventional approach to adnexal mass was laparotomy and unilateral salpingo-oophorectomy). This has evolved immensely with the advent of gynecological endoscopy and emphasis on ovarian conservative surgery., Laparoscopic surgery is increasingly being accepted as the procedure of choice in adolescents., Laparoscopy offers the advantages of better visualization, shorter hospital stay, faster recovery, lesser postoperative pain and a tremendous cosmetic appeal in the adolescent age group.,,, The challenges faced during laparoscopic surgery in adolescents are attributed to the anatomical differences in comparison with adult women. None of our patients experienced major complications, and postoperative recovery was unremarkable. The largest series thus far was reported by Seckin et al. comprising 79 adolescents younger than 20 years who underwent laparoscopic surgery for presumed benign cyst. We had operated on 96 adolescents and in our experience Laparoscopic management is a safe, effective, and feasible option in adolescents. Among our patients, 70.83% had their ovaries preserved. This was comparable to the study by Kim et al. wherein the ovary could be salvaged in 65.1% of the patients. Simple cyst (29.2%) was the most common histopathology. In an analysis by Kinson et al., of all the adnexal masses, 57.9% were cystic and 17.1% were follicular cysts. Dermoid cyst was seen in 14.6%. About 50% of them had presented with torsion. Although AFP is positive in solid tumors and CA 19-9 has specificity for dermoid, we observed that an elevated AFP in both patients was associated with dermoid. Thus, AFP can be useful as a marker for diagnosing a mature cystic teratoma. Three patients who underwent laparoscopy for adnexal mass were preoperatively diagnosed with polycystic ovaries. One among them had presented with torsion and was managed for the same. In the other two patients who were preoperatively diagnosed with an adnexal mass, polycystic ovaries were noted intraoperatively, and laparoscopic ovarian drilling was done. Three patients were diagnosed with Tuberculosis. Surgery was planned in all of them for chronic abdominal pain and persistent ovarian cyst. Peroperatively, cyst was noted in only one patient whereas the other two had military tubercles and a peritoneal biopsy was taken in them. One 13-year-old premenarcheal girl presented with acute abdomen with preoperative ultrasound suggestive of paraovarian mass. She was intraoperatively diagnosed with rudimentary horn that had undergone torsion and was managed with excision of the rudimentary horn. Torsion is a gynecological emergency necessitating immediate intervention. It is all the more important in adolescent age group as the delay in intervention can cause permanent ovarian damage with an impact on future fertility. All patients with torsion (41.7%) presented with acute symptoms and underwent emergency laparoscopic surgery. 97% of the adnexal masses undergoing torsion are a result of benign pathology. Torsion was more common on the right side as a result of protective effect of sigmoid colon on the left side, and simple cysts were the predominant adnexal masses that presented with torsion. The mean diameter of torsed mass was 7.4 cm. These findings are in agreement with various studies reporting the same., Ultrasound was of aid in correctly identifying 82.5% of these patients, and the remaining patients were taken up for surgery based on clinical diagnosis and blood evaluation. The diagnosis of ovarian torsion was supported by ultrasound, approximately, 87% accurate for ovarian pathology. Ovarian cysts are traditionally labeled large when more than 5 cm and giant or voluminous when more than 15 cm. Giant adnexal masses have been managed customarily by laparotomy and cystectomy. We encountered seven cases with diameter over 15 cm. Of these seven cases, three were serous cystadenoma, and two were dermoid cysts. Tumor markers were normal in serous cystadenoma, and AFP was elevated in both the patients with dermoid. All the cases were managed laparoscopically. An initial 5 mm camera port was placed in the epigastrium and the second trocar was inserted into the cyst under direct vision. The cyst contents were aspirated without spillage followed by a cystectomy. Challenges in these cases were a difficult entry, less working space, risk of tumor spillage. While the rupture of stage I ovarian disease significantly affected the disease-free interval is concerning. Cyst rupture and potential tumor spillage were avoided in laparoscopy by the use of endobag to retrieve the mass and liberally extending the trocar incision to safely remove the mass intact in these cases. Limitation of this study is that this is an institution based and retrospective study, so the result obtained may or may not reflect the histological pattern. Laparoscopy is a favored approach in the surgical management of benign adnexal masses. Every effort should be taken to ensure maximal ovarian preservation for future fertility concerns. Ultrasound is a gold standard in preoperative evaluation to ascertain the benign nature of adnexal mass. The laparoscopic approach is effective and safe for managing adolescent adnexal masses. Canis M, Rabischong B, Houlle C, Botchorishvili R, Jardon K, Safi A, et al. Laparoscopic management of adnexal masses: A gold standard? Curr Opin Obstet Gynecol 2002;14:423-8. Eskander RN, Bristow RE. Adnexal masses in pediatric and adolescent females: A review of the literature. Curr Obstet Gynecol Rep 2012;1:25-32. Skiadas VT, Koutoulidis V, Eleytheriades M, Gouliamos A, Moulopoulos LA, Deligeoroglou E, et al. Ovarian masses in young adolescents: Imaging findings with surgical confirmation. Eur J Gynaecol Oncol 2004;25:201-6. Graham L. ACOG releases guidelines on management of adnexal masses. Am Fam Physician 2008;77:1320-3. Kim HB, Cho HY, Park SH, Park ST. Laparoscopic ovarian surgery in children and adolescents. JSLS 2015;19:e2014.00253. Kirkham YA, Lacy JA, Kives S, Allen L. Characteristics and management of adnexal masses in a canadian pediatric and adolescent population. J Obstet Gynaecol Can 2011;33:935-43. Liu H, Wang X, Lu D, Liu Z, Shi G. Ovarian masses in children and adolescents in China: Analysis of 203 cases. J Ovarian Res 2013;6:47. Kinson MS, Spiryda LB. Management of adnexal masses in children and adolescent populations: Advocating for ovarian conservation. Surg Res 2015;2:72-6. Templeman C, Fallat ME, Blinchevsky A, Hertweck SP. Noninflammatory ovarian masses in girls and young women. Obstet Gynecol 2000;96:229-33. Cass DL, Hawkins E, Brandt ML, Chintagumpala M, Bloss RS, Milewicz AL, et al. Surgery for ovarian masses in infants, children, and adolescents: 102 consecutive patients treated in a 15-year period. J Pediatr Surg 2001;36:693-9. Morgan A. Adnexal mass evaluation in the emergency department. Emerg Med Clin North Am 2001;19:799-816. Deligeoroglou E, Eleftheriades M, Shiadoes V, Botsis D, Hasiakos D, Kontoravdis A, et al. Ovarian masses during adolescence: Clinical, ultrasonographic and pathologic findings, serum tumor markers and endocrinological profile. Gynecol Endocrinol 2004;19:1-8. Bast RC Jr., Klug TL, St. John E, Jenison E, Niloff JM, Lazarus H, et al. A radioimmunoassay using a monoclonal antibody to monitor the course of epithelial ovarian cancer. N Engl J Med 1983;309:883-7. Bon GG, Kenemans P, Verstraeten R, van Kamp GJ, Hilgers J. Serum tumor marker immunoassays in gynecologic oncology: Establishment of reference values. Am J Obstet Gynecol 1996;174(1 Pt 1):107-14. Gadducci A, Baicchi U, Marrai R, Ferdeghini M, Bianchi R, Facchini V. Preoperative evaluation of D-dimer and CA 125 levels in differentiating benign from malignant ovarian masses. Gynecol Oncol 1996;60:197-202. Predanic M, Vlahos N, Pennisi JA, Moukhtar M, Aleem FA. Color and pulsed Doppler sonography, gray-scale imaging, and serum CA 125 in the assessment of adnexal disease. Obstet Gynecol 1996;88:283-8. Eltabbakh GH, Belinson JL, Kennedy AW, Gupta M, Webster K, Blumenson LE. Serum CA-125 measurements > 65 U/ml. Clinical value. J Reprod Med 1998;43:635-6. Bae SY, Lee JH, Park JY, Kim DM, Min BH, Rhee PL, et al. Clinical significance of serum CA-125 in Korean females with ascites. Yonsei Med J 2013;54:1241-7. Ozasa H, Noda Y, Mori T. Progesterone increases serum CA-125 in endometriosis. Fertil Steril 1987;47:699-701. Halila H, Stenman UH, Seppälä M. Ovarian cancer antigen CA 125 levels in pelvic inflammatory disease and pregnancy. Cancer 1986;57:1327-9. Jäger W, Diedrich K, Wildt L. Elevated levels of CA-125 in serum of patients suffering from ovarian hyperstimulation syndrome. Fertil Steril 1987;48:675-8. Niloff JM, Klug TL, Schaetzl E, Zurawski VR Jr., Knapp RC, Bast RC Jr. Elevation of serum CA125 in carcinomas of the fallopian tube, endometrium, and endocervix. Am J Obstet Gynecol 1984;148:1057-8. Molina R, Filella X, Bruix J, Mengual P, Bosch J, Calvet X, et al. Cancer antigen 125 in serum and ascitic fluid of patients with liver diseases. Clin Chem 1991;37:1379-83. Talbot RW, Jacobsen DJ, Nagorney DM, Malkasian GD, Ritts RE Jr. Temporary elevation of CA 125 after abdominal surgical treatment for benign disease and cancer. Surg Gynecol Obstet 1989;168:407-12. Oltmann SC, Garcia N, Barber R, Huang R, Hicks B, Fischer A. Can we preoperatively risk stratify ovarian masses for malignancy? J Pediatr Surg 2010;45:130-4. Ryoo U, Lee DY, Bae DS, Yoon BK, Choi D. Clinical characteristics of adnexal masses in Korean children and adolescents: Retrospective analysis of 409 cases. J Minim Invasive Gynecol 2010;17:209-13. Marret H. Doppler ultrasonography in the diagnosis of ovarian cysts: Indications, pertinence and diagnostic criteria. J Gynecol Obstet Biol Reprod (Paris) 2001;30 1 Suppl:S20-33. Van Calster B, Timmerman D, Bourne T, Testa AC, Van Holsbeke C, Domali E, et al. Discrimination between benign and malignant adnexal masses by specialist ultrasound examination versus serum CA-125. J Natl Cancer Inst 2007;99:1706-14. Berger-Chen S, Herzog TJ, Lewin SN, Burke WM, Neugut AI, Hershman DL, et al. Access to conservative surgical therapy for adolescents with benign ovarian masses. Obstet Gynecol 2012;119(2 Pt 1):270-5. Bristow RE, Nugent AC, Zahurak ML, Khouzhami V, Fox HE. Impact of surgeon specialty on ovarian-conserving surgery in young females with an adnexal mass. J Adolesc Health 2006;39:411-6. Lass A. The fertility potential of women with a single ovary. Hum Reprod Update 1999;5:546-50. Broach AN, Mansuria SM, Sanfilippo JS. Pediatric and adolescent gynecologic laparoscopy. Clin Obstet Gynecol 2009;52:380-9. Mayer JP, Bettolli M, Kolberg-Schwerdt A, Lempe M, Schlesinger F, Hayek I, et al. Laparoscopic approach to ovarian mass in children and adolescents: Already a standard in therapy. J Laparoendosc Adv Surg Tech A 2009;19 Suppl 1:S111-5. Takeda A, Manabe S, Hosono S, Nakamura H. Laparoscopic surgery in 12 cases of adnexal disease occurring in girls aged 15 years or younger. J Minim Invasive Gynecol 2005;12:234-40. Panteli C, Minocha A, Kulkarni MS, Tsang T. The role of laparoscopy in the management of adnexal lesions in children. Surg Laparosc Endosc Percutan Tech 2009;19:514-7. Michelotti B, Segura BJ, Sau I, Perez-Bertolez S, Prince JM, Kane TD. Surgical management of ovarian disease in infants, children, and adolescents: A 15-year review. J Laparoendosc Adv Surg Tech A 2010;20:261-4. Seckin B, Ozdener T, Tapisiz OL, Batioglu S. Laparoscopic treatment of ovarian cysts in adolescents and young adults. J Pediatr Adolesc Gynecol 2011;24:300-3. 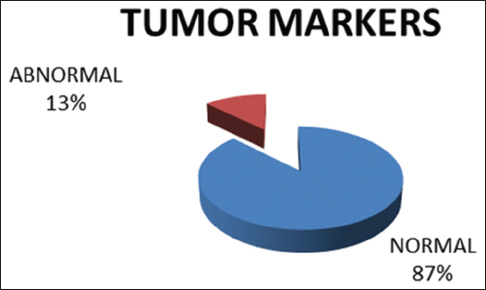 Var T, Tonguc EA, Ugur M, Altinbas S, Tokmak A. Tumor markers panel and tumor size of ovarian dermoid tumors in reproductive age. Bratisl Lek Listy 2012;113:95-8. Kokoska ER, Keller MS, Weber TR. Acute ovarian torsion in children. Am J Surg 2000;180:462-5. McCarthy JD, Erickson KM, Smith YR, Quint EH. Premenarchal ovarian torsion and elevated CA-125. J Pediatr Adolesc Gynecol 2010;23:e47-50. Rousseau V, Massicot R, Darwish AA, Sauvat F, Emond S, Thibaud E, et al. Emergency management and conservative surgery of ovarian torsion in children: A report of 40 cases. J Pediatr Adolesc Gynecol 2008;21:201-6. Vijayaraghavan SB. Sonographic whirlpool sign in ovarian torsion. J Ultrasound Med 2004;23:1643-9. Dolan MS, Boulanger SC, Salameh JR. Laparoscopic management of giant ovarian cyst. JSLS 2006;10:254-6. Hilger WS, Magrina JF, Magtibay PM. Laparoscopic management of the adnexal mass. Clin Obstet Gynecol 2006;49:535-48.